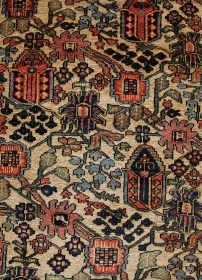 Owen is one of Europe's most committed and active carpet and textile art specialists. He is based in Abergavenny, Wales and offers a wide range of collectable material. active since November, 8, 2006. 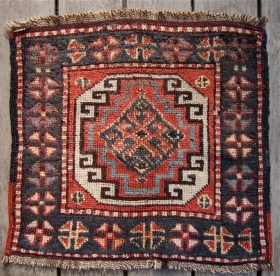 Superb small khamseh rug. Made with the finest wool and dyes. 19th century. Old repairs and damage to borders. 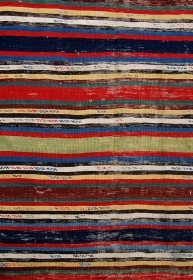 114 x 58cm. 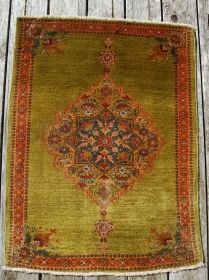 Antique green ground tekke chyrpy. Circa 1875. 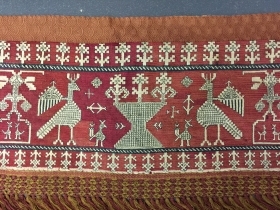 Fine embroidery and good condition. Ziegler poshti. 90 x 67cm. 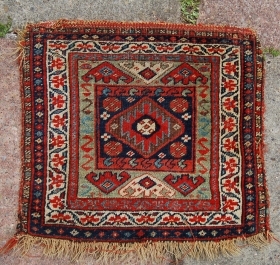 Super fine weave and good colour. Minor faults. 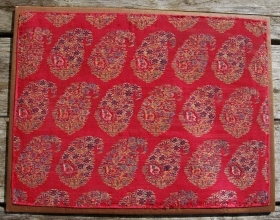 Lovely antique tibetan seating square. 50 x 50cm. Wool foundation, organic dyes and perfect condition. Glimpses of a few pieces i will show at next weeks Larta show in London. Larta.net for all the details. 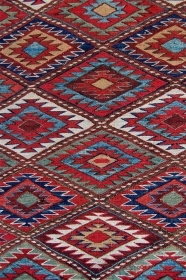 Antique Qashqai kiilim. 19th century. 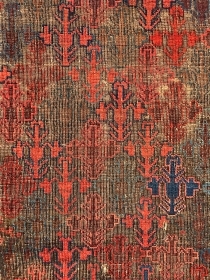 organic dyes. some minor spots of repair. 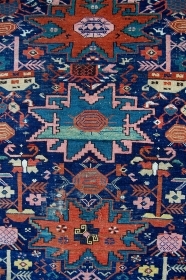 300 x 165cm. 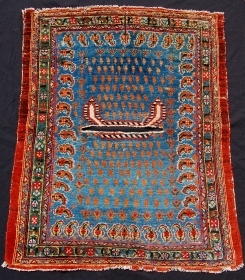 Super fine antique marasali caucasian prayer rug. 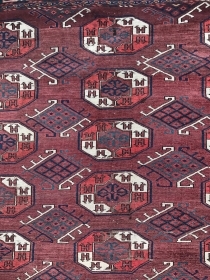 114 x 86cm. Needs a clean and some repairs to the ends. 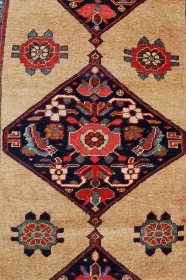 Antique seichur rug. 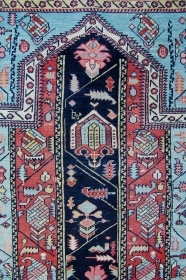 Leshgi design. 19th century. Some minor wear and edge losses. Organic dyes. Priced to sell. 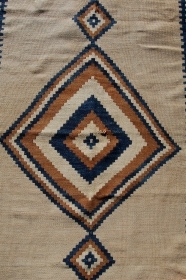 182 x 103cm. price: £385 [500$] plus post. Wishing all a peaceful new year and a prosperous 2019..
Shashavan sumak mafrash side panel. Crisp weave and rich colours. In good condition. Late 19th century century. 105 x 45 cm. price: £395 [$500] plus post. 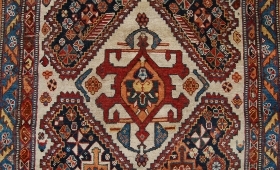 Antique Ersari chuval. 19th century. Lovely wool and good drawing of the guls. 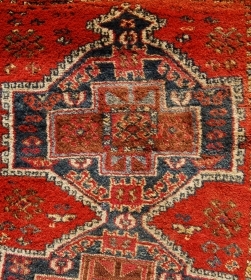 Good unrestored condition and dyes. 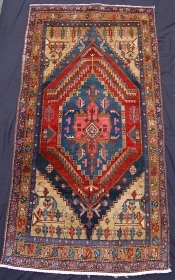 156 x 97 cm. 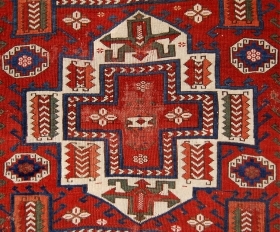 Antique Bijar square or poshti. 19th century. 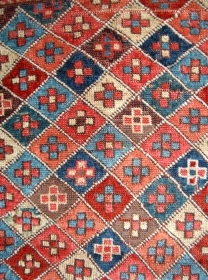 Fine weave and good colours. Slight edge fraying. 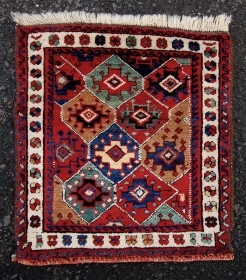 72 x 67cm. 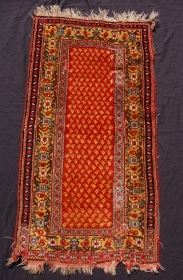 Complete antique sumak khorjin. 19th century. Probably shashavan tribes. Good unrestored condition with lovely old colours. 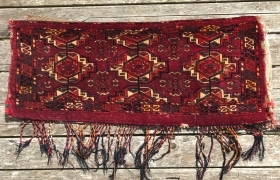 134 x 55cm. Yomut group chuval. 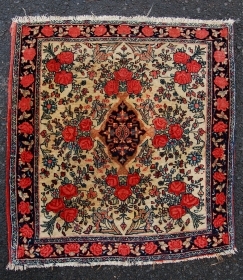 19th c. Unusual border. Asymmetric open right. Good condition. Original back. 114 x 80cm. 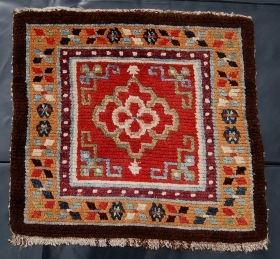 Charming Baktiari village rug. Early 20th century in good useable condition. 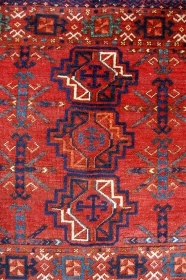 206 x 142cm. 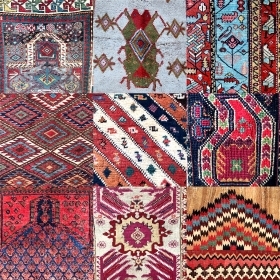 East anatolian kurdish rug. 19th century. High pile and intense dyes. Inexpensive. 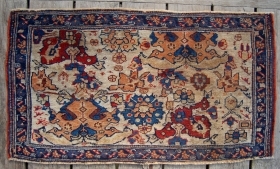 Lovely antique camel field Bijar rug. 19th century. Some minor wear but no repair. Floppy handle. 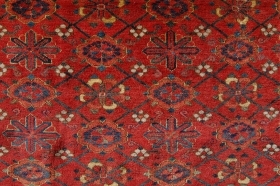 250 x 122cm. 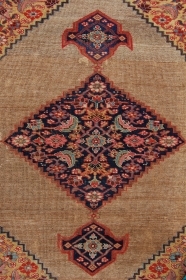 Antique Heriz rug. 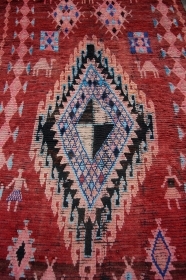 198 x 102cm. Nice pile and pretty design. some edge repair. 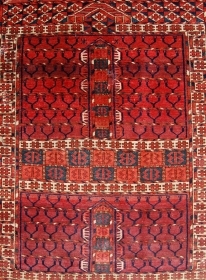 Antique Bijar rug. 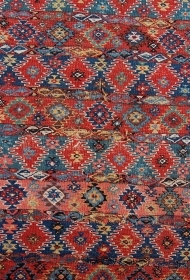 19th century.160 x 109cm. Sides over wrapped and Im assuming the borders are missing. But still a lovely thing. Eagle gul torba. 19th .c. 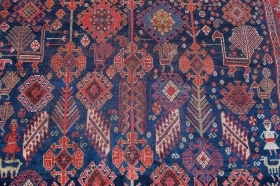 110x46cm. Good pile, some mothing. Original back. 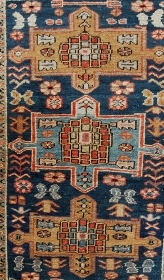 Fine antique Khamseh bagface. 19th century. 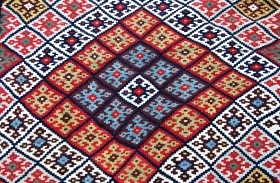 42 x 46cm. 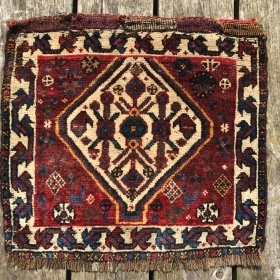 Soft wool and rich colours. 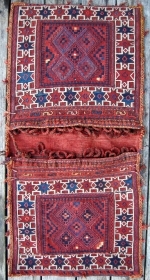 Kurdish bag. Good colours. 19th.c. Baluch tree design balisht. Nice wool but low pile. 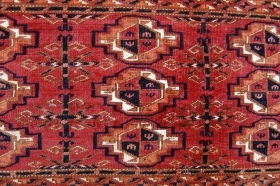 Kurdish bag face with a memling gul design. Circa 1900. 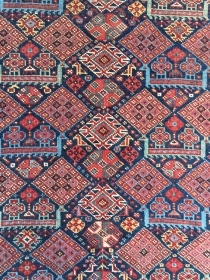 49 x 54cm. 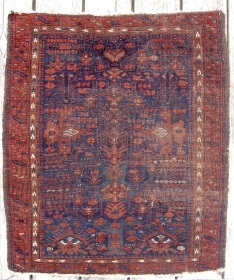 Antique Afshar bagface. Good age, circa 1880. 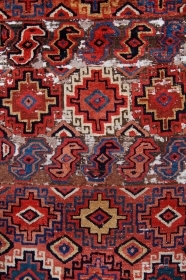 84 x 50cm. Shashavan piled bagface. nw Persia. Circa 1850. 59 x 55cm. The colours are a joy. 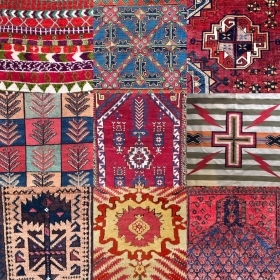 Complete Baluch or Aimac sumak saddle bags. Good colours and great condition. 19th.c. 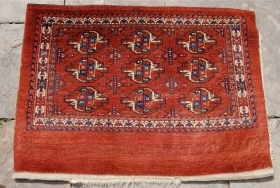 110 x 53cm. Rare.